Storchenwiege are made of strong threads of 100% cotton woven lengthwise and crosswise. The diagonal elasticity this creates remains even after it has been washed several times. The sling is shrink-resistant and can be washed at up to 60°C, but should not be put in the tumble-dryer. 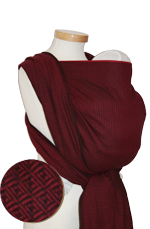 Our Storchenwiege® baby slings are regularly checked by an independent testing institute. Our cotton yarns, which contain no harmful substances, are repeatedly inspected during production. The cotton yarns are also certified pursuant to the „Oeko-Tex Standard 100“. The controlled-production dyes used are non-toxic and contain no heavy metals. Because of the sling's stable quality, we give two years' guarantee when it is used in accordance with the care symbols listed and with the tying instructions which come with it.